1881 The first portion of a road is built from Bourg d'Oisans to La Garde. 1905 The road is extended to Huez during the building of a cable car used to transport coal from the top. 1923 The road is further extended to Alpe d'Huez but measures just 4 meters at its widest point. 1936 New funding is used to improve the road. 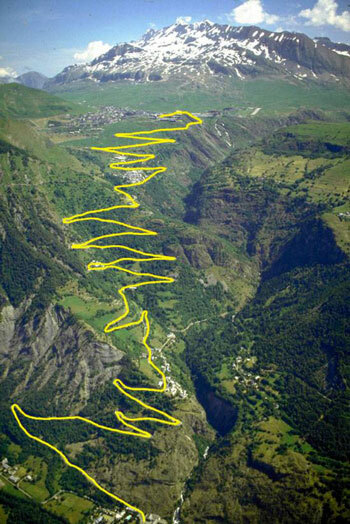 At 7 meters wide with 21 now famous hairpins, the climb from Bourg d'Oisans to Alpe d'Huez is born as we know it today. 1933- 1939 A wave of hotel development coincides with the introduction of paid holidays for workers of the Front Populaire government and by 1939 over a dozen hotels are open year-round. 1939- 1945 During the war years, Alpe d'Huez is a center of resistance and hides refugees including American pilots, Jews on the run following the German occupation of Vichy France and French men escaping forced labour in Germany. Near the end of the war, a German commandant disobeys a command to burn Alpe d'Huez to the ground, sparing the great hotels. 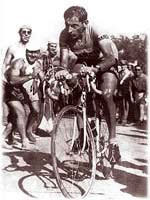 1952 The great Italian cyclist, Fausto Coppi, is the first winner of Alpe d'Huez in the Tour de France. 1968 The road is improved in preparation for the Grenoble Winter Olympic bobsleigh events... the same year Frenchman Jean-Claude Killy sweeps all the alpine skiing events. 1976-1989 Riders from the Netherlands win 8 of 13 times and the mountain is nicknamed "Dutch Mountain". To this day, it is estimated that 1/3 of the Tour de France fans lining Alpe d'Huez are from the Netherlands. 1995 The best pure climber of all-time, Marco Pantani, records the fastest ascent to date (36 mins 50 secs). Marco Pantani also holds the second and third fastest ascents all-time. 2004 In front of an estimated million people, Lance Armstorng wins the first Alpe d'Huez time trial but comes 46 seconds short of Marco Pantani's record. 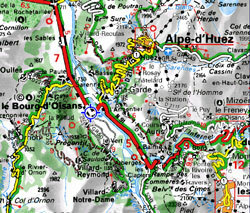 -2006 Alpe d'Huez is featured in every Tour de France for the last thirty years except eight. In 1979, it is used twice. The climb to Alpe d'Huez is a good one but its reputation set my expectations too high. Don't treat this as a negative conclusion but rather a reflection on the high quality of cycling in France. So what makes Alpe d'Huez so famous? It's one of oldest ski resorts in France, but it's probably more famous now as a finishing climb in mountain stages during 23 of the last 31 Tour de France events. The road up to Alpe d'Huez makes a great climbing stadium because it's wide and has the infrastructure at the base and top to handle over a million people as it did during the 2004 time trial. Remember, many great climbs in France are too narrow and remote for Tour consideration. As I'll attempt to convey in future reports, there are many beautiful, quiet roads in France with views as impressive as those found along Alpe d'Huez. 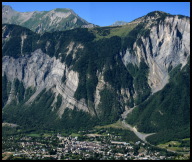 In fact, some of them are right in the Oisans region. The climb up Alpe d'Huez is 13.8 km with an average gradient of 8.1% (1130 m) with 21 switchbacks marked with signs honoring each of the Tour de France/Alpe d'Huez stage winners. Since the Tour has now used Alpe d'Huez more than 21 times, the lower signs have been doubled up as you'll notice on the first bend with a double panel honoring both Fausto Coppi and Lance Armstrong; Fausto was the first Tour winner of Alpe d'Huez in 1952 and Lance was the 22nd winner in the year 2000. With the exception of several scenic switchbacks on the climb, the scenery around Alpe d'Huez is best viewed while descending rather than looking over your shoulder. In fact, the scenery, the width and condition of the road make it one of the better descents you'll ever come across. For a recreational cyclist, sharing a climb with many vehicles and having it end at a gigantic ski resort complex makes it anticlimactic in my opinion. It's just not in the same league as other equally famous climbs such as nearby Col du Galibier. It's safe to say that most recreational cyclists climb the road to Alpe d'Huez to vicariously experience the Tour de France. Nothing wrong with that of course. In fact, enough recreational cyclists climb Alpe d'Huez each summer that commercial photographers make a business sitting on little canvas stools clicking away all day long. Not surprisingly, a cyclo-sportif that finishes at the top of Alpe d'Huez each year has latched onto the coattails of the growing Alpe d'Huez/Tour de France fame. La Marmotte is an annual (July) 108-mile sufferfest looping over three tough mountain passes, totaling 16,500 feet of climbing, with the last one being Alpe d'Huez. Many very good domestic riders show up each year to race but the goal of most of the 6,000+ participants is a silver or bronze diploma — to simply finish. I was one of those 6000+ participants this past year. For several reasons, one being the purchase of a new home in Berkeley, I had cycled less this past spring than any of the previous 12 years. But I felt my good base would get me through the day which it did. I decided to leave my camera at our gite to focus on the task at hand. The pictures is this report where taken before and after the Marmotte except for those taken by others as noted. Since our nice gite in Huez Village, as aptly chosen by Philippe Crist, was just several km from the top of Alpe d'Huez, our “warm-up” consisted of a 6 mile descent to Bourg d'Oisans at 7:30 AM to the start line. While descending and rubbing the sleep from my eyes so I could enjoy the spectacular view across the valley, I got a second wake up call when a guy's rear wheel blew just ahead of me. I guess he then braked too hard because he started fish-tailing wildly down the center line. I went around him hoping he wouldn't choose to land on the side of the road I had also chosen. I heard him hit the deck just after I passed. As you can imagine, the start was chaotic. In fact, things were so conjested (slow) for the first km that it was easier to just push with one foot. Things started to spread out up the first climb as I settled into a steady pace knowing it would be a long day and I had no illusions about my fitness. At the top of the first climb, Col du Glandon, I stopped for water but this was an unofficial feed stop and they would only hand out water if you were Dutch! Ever since cyclists from the Netherlands won eight Tour de France Alpe d'Huez finishes between 1976-1989, the Dutch have claimed Alpe d'Huez and the Marmotte as their own. A logjam was forming at the top due to a crash at the front of the “race” on the descent so they wouldn't let trailing riders descend until the 10 or so riders, many of them seriously injured, were removed. Among the injured included a marshall who was knocked off a cliff! A rider was actually killed on the same descent during last year's event. After an hour there must have been over 3000 anxious riders at the top waiting to resume the event. Some couldn't wait and either butted to the front by walking their bikes around the mass on the road or precariously baby stepping down the mountain, cyclocross style, over slippery grass past the point of the accident and cutting out several switchbacks in the process. When the road opened again, riders were released in groups of fifteen. One look at the profile for this two-tiered, hors catégorie, climb says it all. I was spent after reaching Col du Telegraphe and the fun was just starting. My ill-prepared, dare I say, aging body wasn't holding up well. The climb up Col du Galibier was hard and long and I climbed at a pace I feel embarrassed to admit. It's tough to appreciate the surrounding beauty when you're in the red but I did take note. Looking down the scenic switchbacks, I could see an endless line of ants marching behind me. At the top, I stopped for nourishment and crammed down anything I could get my hands on including orange slices, carrot cake, bananas and apricots. My body could have easily called it a day if it was convenient to do so; however, I've always felt suffering is my best cycling skill so with my stomach full I dropped from the sky. The descent of Galibier is equally fabulous and by the time I dropped down to Col du Lautaret I was feeling surprisingly chipper. I needed all my reacquired faculties because weaving around weekend traffic and through tunnels on the main road down to Bourg d'Oisans was downright dangerous for the first half. Any feeling of recovered strength quickly left my body with the infamous 11% left turn near the base of Alpe d'Huez. I was out of gears and energy. Alpe d'Huez is a very hard climb after 100 miles of cycling and 13,000 ft of climbing already in the books. It seemed like I spent every climb during the day in my last gear... 39-27. I could have used a bailout gear or even a triple right from the very first climb. I had ample opportunity to reflect on my poor condition as I lay prone on the grass halfway up Alpe d'Huez wondering how I could have let my body down so badly during the spring. I also gave the French Alps due credit for contributing to a thorough beating. After five minutes of feeling sorry for myself, I awkwardly remounted my bike and inched passed riders who were walking until the road leveled out near the finish. With my legs spinning again, I even sprinted to the line and felt no shame in pipping another rider at the line. I downed the mediocre post race pasta meal at the top, didn't bother to check the results, forgot to hand in my race chip and descended back to my gite in Huez for a shower and to check how the other three guys, who I hadn't seen since the first climb, had faired and to reflect on the day. The Marmotte is a beautiful, but dangerous ride when done with 6000 other riders and no road closure! The weather was perfect for this year's event. No cold or freezing rain horror stories to report from the top of Col du Galibier this year. Next time, I'll be better prepared. It just happened l'Étape du Tour finished at the top of Alpe d'Huez this year and only two days after the Marmotte. For those unfamiliar with the Etape, it's a 14 year-old event, now run by the Tour de France organizers, that has grown wildly in the last few years because it follows the same route of a current Tour de France mountain stage with full road closure. It's usually held a week before the Tour de France passes over the same course and normally on a Tour rest day. The four of us were planning on doing the Etape instead of the Marmotte but we were all lottery losers when our group entry wasn't selected. Much to the bemusement of the three guys traveling from the U.S., our leader Philippe remembered his subscription to Velo Magazine entitled him to an automatic entry. So he ended up doing the Marmotte/Etape double. Mark also entered the Etape after successfully buying a dossard on the black market before leaving the U.S. 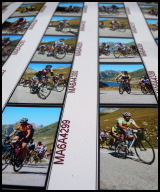 While Mark and Phillipe were doing the Etape, I made the most of a beautiful clear day and shot many Alpe d'Huez photos and even slipped around a Gendarmerie road block so that I could capture exclusive Etape Alpe d'Huez footage for my faithful viewers. The suffering I witnessed up Alpe d'Huez was nothing I had seen from cyclists before — riders ralphing, dazed guys standing under waterfalls attempting to cool down and ambulance sirens wailing all afternoon. Pure suffering at its finest... and I captured it on video too! Actually, I didn't have a video exclusive. Not surprisingly, Velo Magazine was out shooting start to finish video. Among their online clips, is video of the winner, from AG2R, soloing up Alpe d'Huez and across the line in 6 hours.